Rex Bledsoe, CEO of Aqua Design and die-hard Denver Broncos fan, started selling fly fishing and outdoor apparel for men in 1998. Twenty years later, 75% of his business is dedicated to one-of-a-kind clothing for women. Over the years, Aqua Design developed a lifestyle look that many women adore with beach, surf, and outdoor apparel in unique hydro-print patterns. Today a majority of their sales come from Amazon, but they’re also available on Walmart’s online marketplace as well as their own site. 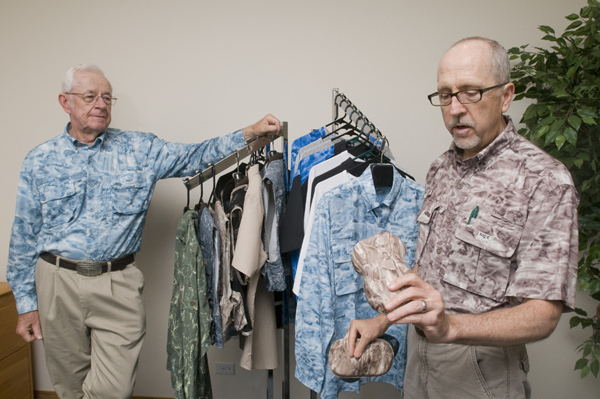 Aqua Design CEO and General Manager Rex Bledsoe, right, displays the hydro-print products the company designs. Aqua Design uses MerchantWords to optimize all aspects of their product listings. “We wouldn’t consider, at this point, even building a listing without the use of MerchantWords. Without optimizing it’s going to be very difficult for people to find your great product,” said Bledsoe. Aqua Design's women's rash guards are top-sellers. 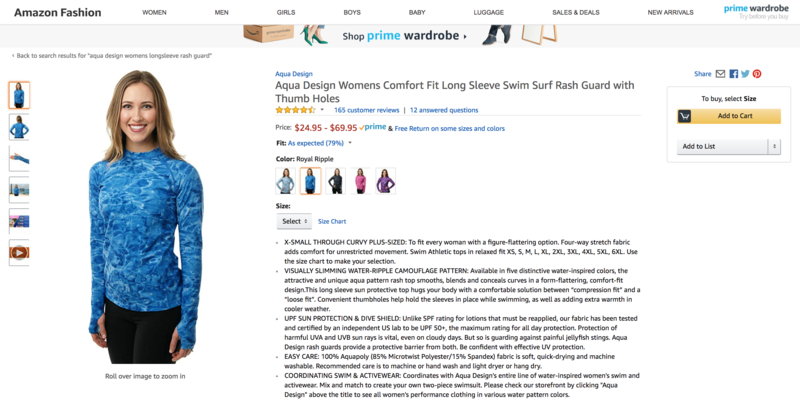 The above table is an example of the positive and negative keyword lists Aqua Design creates for their Amazon Sponsored Ad campaigns. Aqua Design recently launched their stores in the Amazon UK and Amazon Canada marketplaces and plans to expand to more countries soon. They feature a wide variety of outdoor adventure apparel for men, women, and children – specializing in everything from shirts, leggings, and activewear, to hats, rash guards, and sun protection clothing all featuring their unique water camouflage design. You can find Aqua Design products on Amazon US, UK, and Canada as well as Walmart, and at AquaDesign.com.